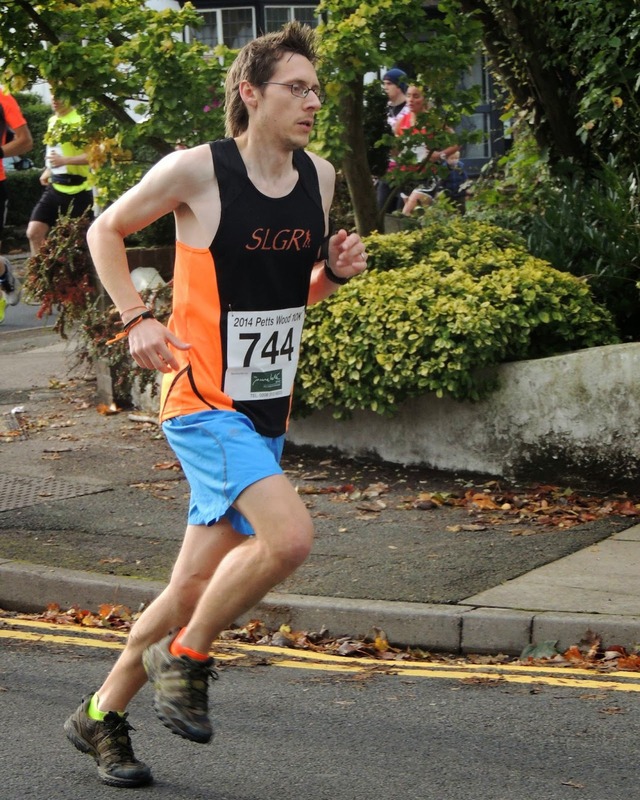 I entered the Petts Wood 10k 2014 a few weeks before the race day as an SLGR affiliated runner at a cost of £13, and then just a few days later, at the Les Witton Dartford 10, I developed some pain in the top of my left foot. Thankfully by the time race day rolled around the pain had gone and the foot felt fine to run on. The downside was that I had barely done any running in the three weeks prior to the race. 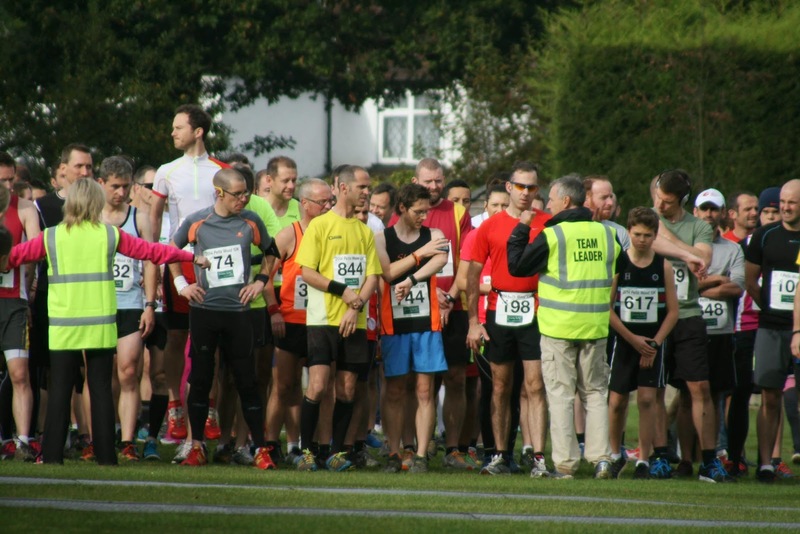 In the week leading up to the race, an email was sent out by the organisers, Petts Wood Runners, detailing the race day arrangements. 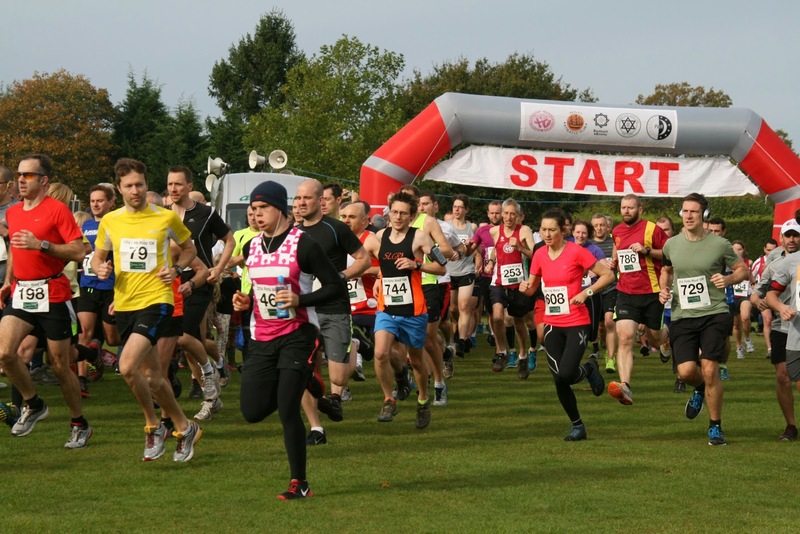 The full race pack was available for download from the Petts Wood Runners website - the downloadable race pack fitted in with the ethos of this race which was to be ecologically friendly. In addition to the electronic race pack, they didn't use plastic bags for post-race goodies, the cups at the water stations were bio-degradable, the cakes, beers and food are all locally sourced, and they also sorted the post-race rubbish so that as much as possible was recycled. My return to running had been the previous day at Dartford parkrun event 12 where I struggled to get anywhere near my usual parkrun pace. With that in mind I knew to expect a slightly slower performance at the 10k. However, I still wanted to run my best possible time. I drove to Petts Wood and parked on the residential streets adjacent to the venue. The race HQ was at the Willett Recreation Ground which had ample space for the registration, massage tent, cake stand, hot food stand, toilets, baggage tent, bouncy castle and everything else that you would expect to find. There was a really nice vibe at the race HQ and in addition to the 10k runners there were plenty of children and other family members and/or supporters. The event also featured a performance from local band The Dirty Perks, which really added to the great atmosphere. 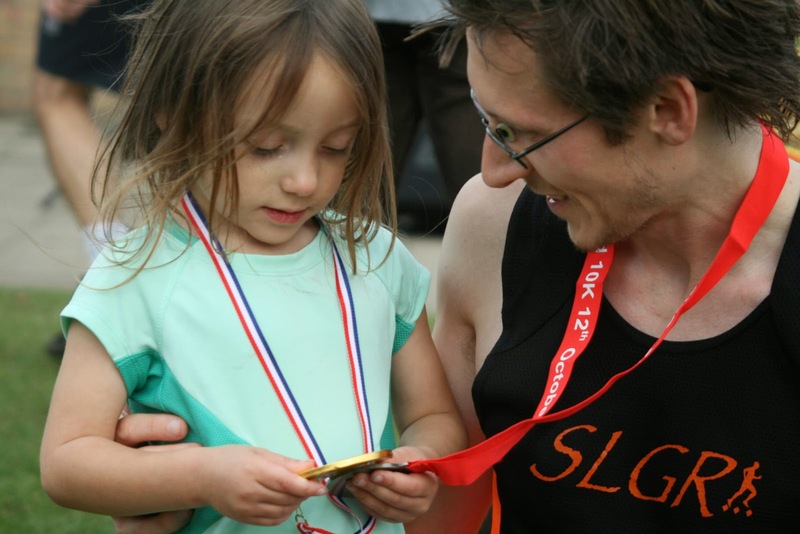 While I collected my race number with inbuilt timing chip, the wife registered our daughter for the children's race. Soon after this I started bumping into, and chatting to, fellow runners including one who is doing the #7weeksofparkrun challenge. 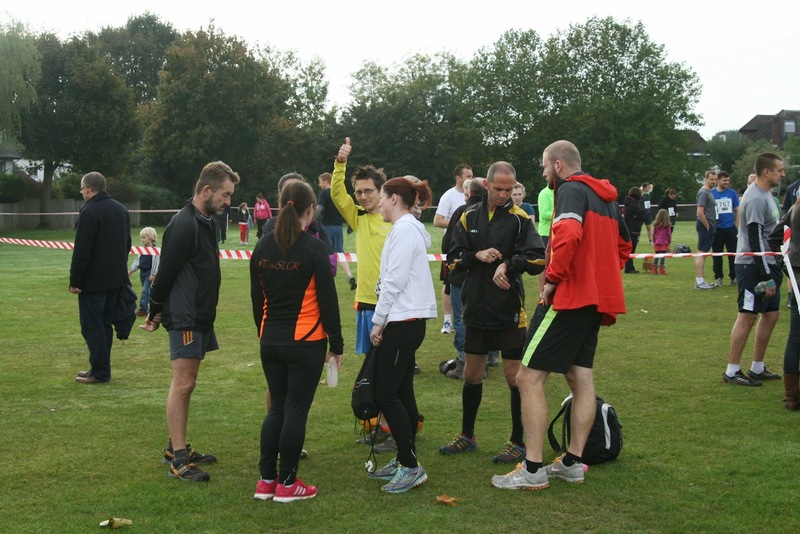 There were six 'So Let's Go Running' runners taking part in the race and eventually #TeamSLGR plus our friends from Swanley AC and Plumstead Runners had formed a little huddle. When the race start time came around, we were directed to line up in our predicted finish time pens. If I hadn't had the problem with my foot I would have optimistically lined up in the sub-40 pen, but as I knew that I'd be slower than usual, I took a more conservative approach and went into the 40-45 minute pen. The start was staggered and the first group went off about 10 seconds before us in the second pen. The subsequent pens were released at regular intervals of about 10 seconds until all of the pens were empty. This race would definitely go down as mixed terrain. It started on grass with a lap of the recreation ground before heading out onto the local streets, which eventually lead to a footbridge (with steps on both sides) that crossed the railway line. After this the course was a mixture of more roads, uneven tarmac or concrete paths, grass and forest trails. The course undulated throughout, had a couple of steeper climbs and one steep downhill thrown in for good measure. Once over the railway, the course had a steady incline followed by a steady decline until reaching the 3.7 kilometre point. 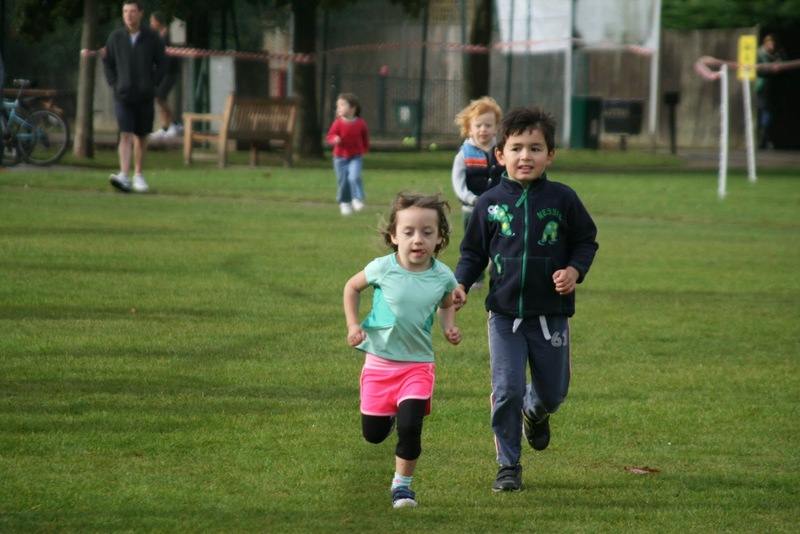 Around this time the children's races got underway - the first was the 5-7 year olds, and there were so many entrants that this age group were split into two separate groups, which is very encouraging for the future! My daughter went out in the first wave and completed the 400 metre course with no walking breaks and was given a chocolate medal at the end. Once the younger children had finished, the 8-11 year olds had their turn. It was good to see the junior races on the day's schedule, but there seemed to be a oversight for anyone aged 12-16, who unfortunately ended up excluded from the junior and adult races. Back to the main event, and the 3.7 kilometre point marked the start of the first challenging incline which lasted for the next 600 metres. The course then headed downhill for a bit. From 4.7 to 6.5 kilometres the course went back uphill and upon passing the 5 kilometre point, the race entered Petts Wood itself. At the 6.5 kilometre point the course reached its highest point and continued to undulate but making its way back downhill. While in the woods this was a proper twisty trail run with tree roots, mud and other hazards (eg a slippery wooden bridge) to look out for. There was a good amount of support in the woods with a couple of places being particularly noisy - especially the spot where a few members of The Dirty Perks had relocated themselves to the woods and where knocking out some tunes - as I passed they happened to be playing 'Don't Look Back in Anger' by Oasis. This part was captured on video, and you can see me pass by at around 51 seconds into this video. On the subject of videos, there is a full course fly through on youtube. Towards the end of the section in the woods the route went past a stone memorial to William Willett. He was the man that had the idea and campaigned for daylight saving time to be introduced - it is said that the idea came to him while riding his horse in Petts Wood. He died in 1915, the year before daylight saving became law so he never lived to see his idea in action. The memorial features a sun dial which is permanently set to British Summer Time in his honour. Incidentally he is the great-great-grandfather of Chris Martin - the lead singer of the band Coldplay. 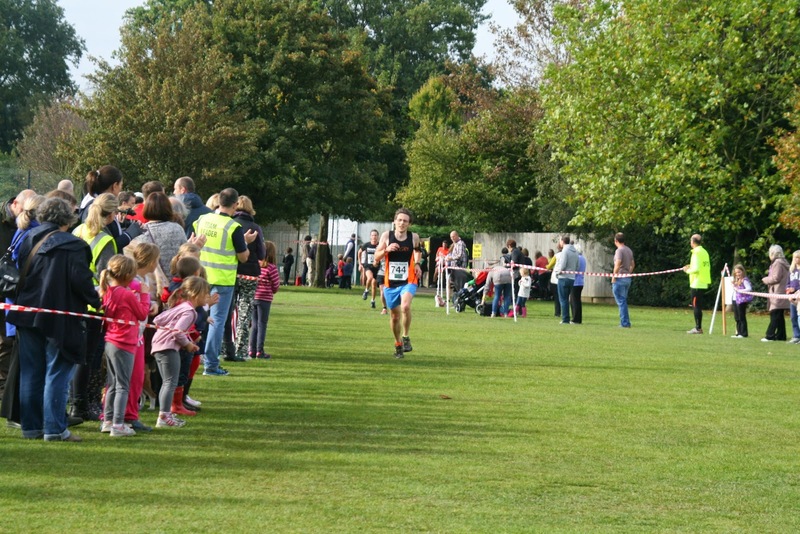 Just after the 8 kilometre point the race exited the woods and went back onto the local roads which lead back towards the Willett Recreation Ground where the runners were back onto the grass to sprint for the finish line. 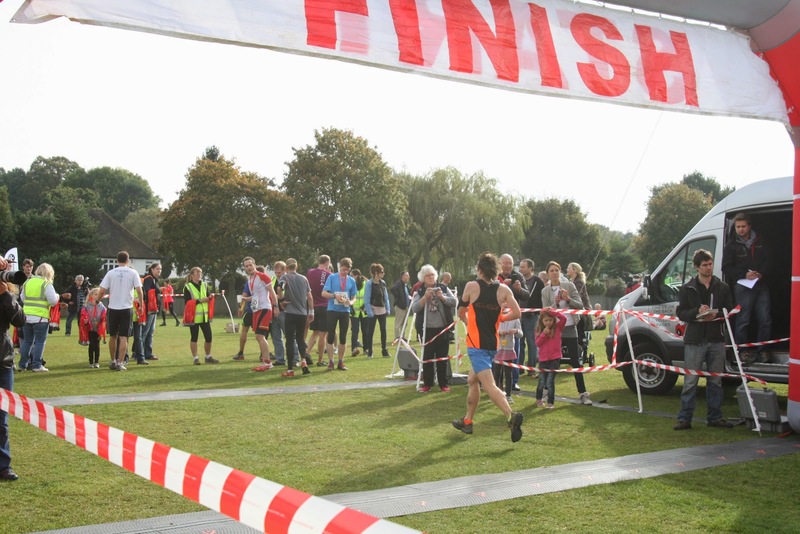 Once across the line, all participants were presented with a really nice bespoke Petts Wood 10k medal, plus there was an abundance of bananas, water and vegetable samosas on offer for all finishers. 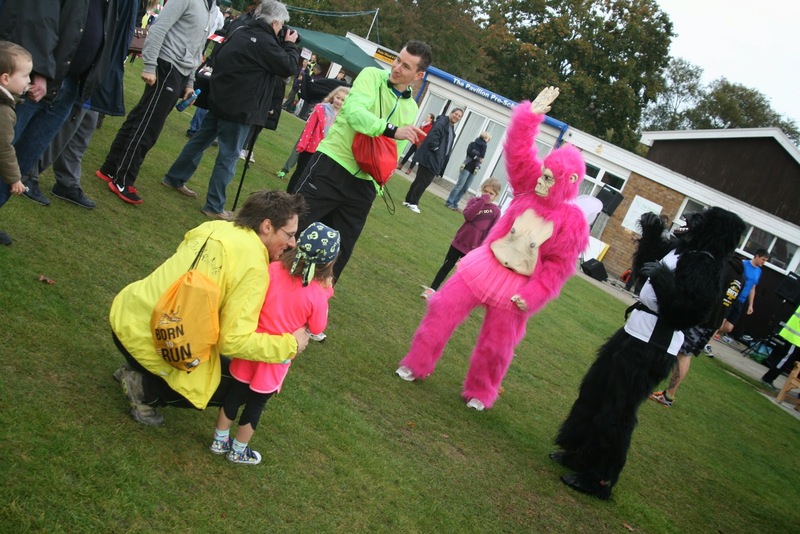 One of the quirky features of the race was the race mascot Woody the gorilla - this year Woody was joined by his new girlfriend Woodina. 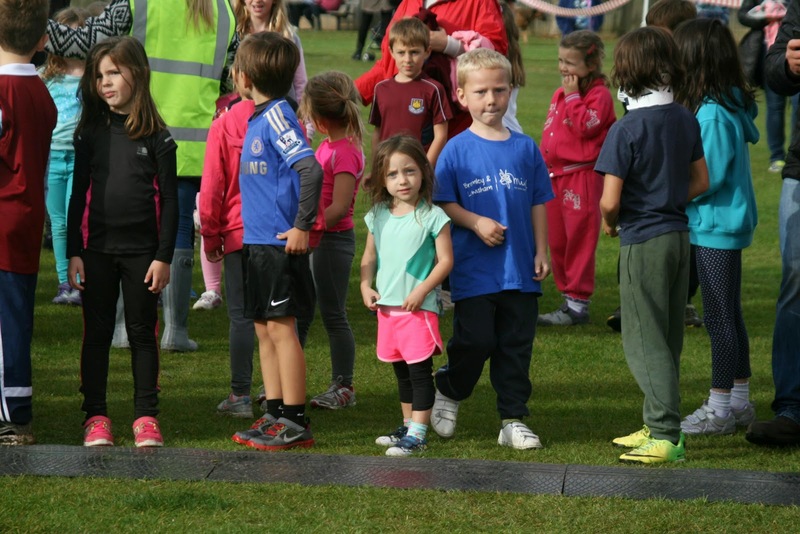 It was great fun for the kids (and adults) and really added to the brilliant atmosphere at the race HQ area. I suspect that the real effort made by the organisers to include all of the added extras are part of the reason that this event sells out every year. 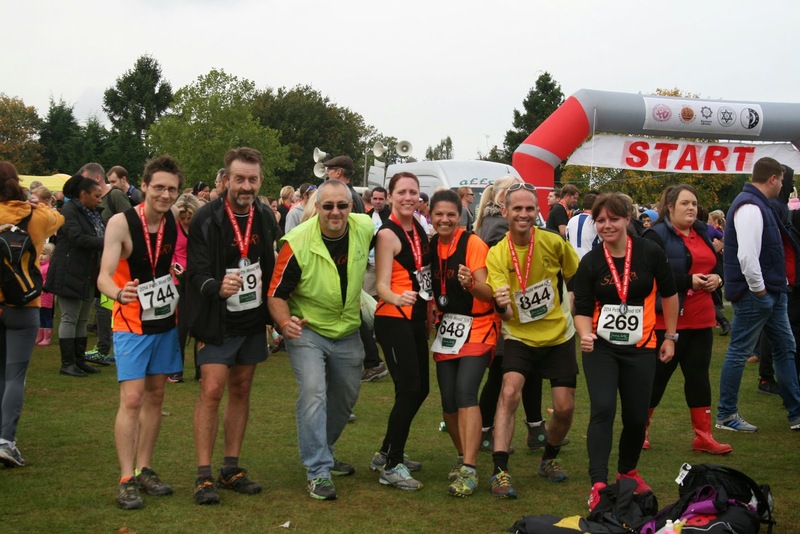 This year 678 runners finished the race and the official results are available for viewing on the Petts Wood Runners webpage. My chip time was 42.24 and I finished in 35th position which puts me in the top 5.2% of finishers. That is a good result for me, but I can't help feeling a little disappointed because I know that without the interruption to my training I could have been a minute or two faster than that. My overall feelings about the 10k race are slightly mixed - I think as an event it was faultless and I cannot praise the Petts Wood Runners enough - the enthusiasm and support from all around the course was fantastic. The course itself was a mixed bag of road running on pleasant but uninspiring residential back streets followed by some amazing running on the fun, twisty, undulating trails in the woods. However, I would have prefered to have spent a larger percentage of the race in the woods, which for me was the best part.